Welcome to Melanie’s March News! We actually haven’t been anywhere of note this month. It’s all been about getting portraits completed for deadlines. However whilst we have been busy bees in our studio…the sun has shone outside in the garden and has started to make the everything flourish. This is my favourite time of year. The promise of spring with the longer evenings, lighter mornings and warmer days. It is wonderful to be able to have the studio door open, Lily laying on the doormat and the chickens basking outside the studio door… always waiting for their next cream cracker to arrive! The garden is looking ok. I haven’t had much time to weed or clear but even without my help it seems to be happy. 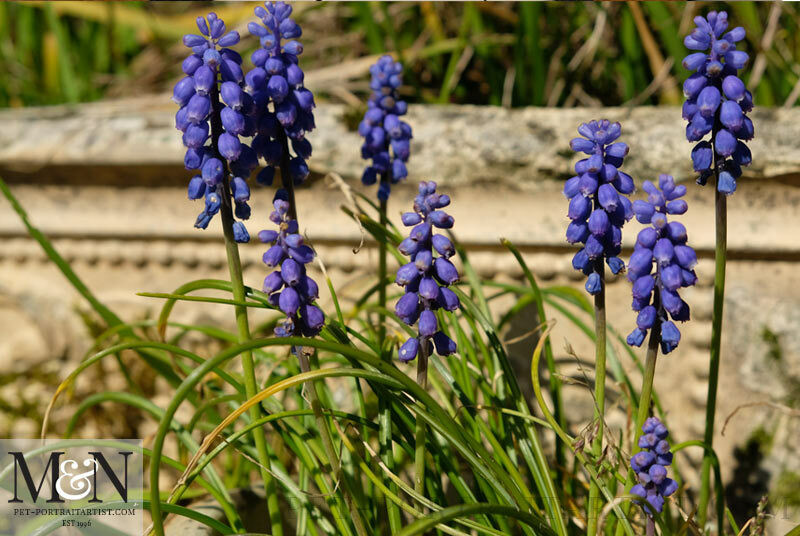 The Grape Hyacinths are in full flower as you can see from the photo below. The bright, rich purple colour is a lovely contrast to the old sandstone tubs behind and really stand out well in the front garden this year. 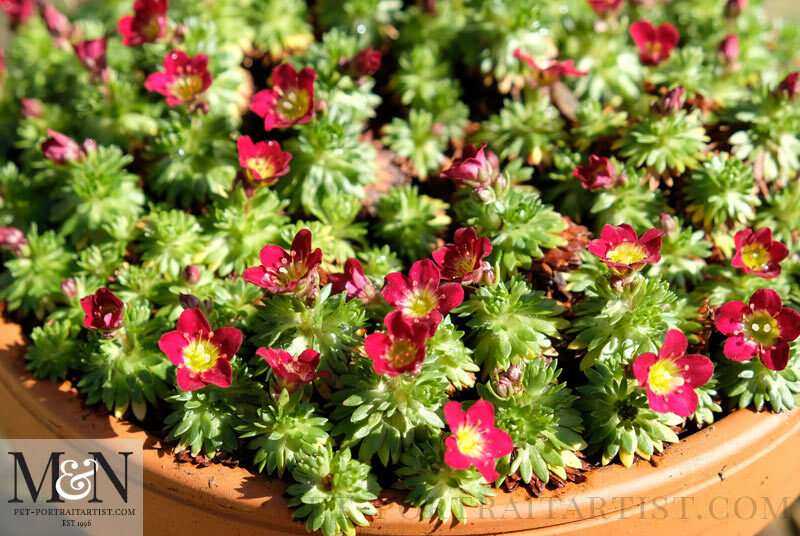 The alpines have been in the greenhouse all winter and are waiting for me to retrieve them and put them out into the sunshine. We have had a few frosts lately so they will come out soon. The Saxifraga is in flower already. 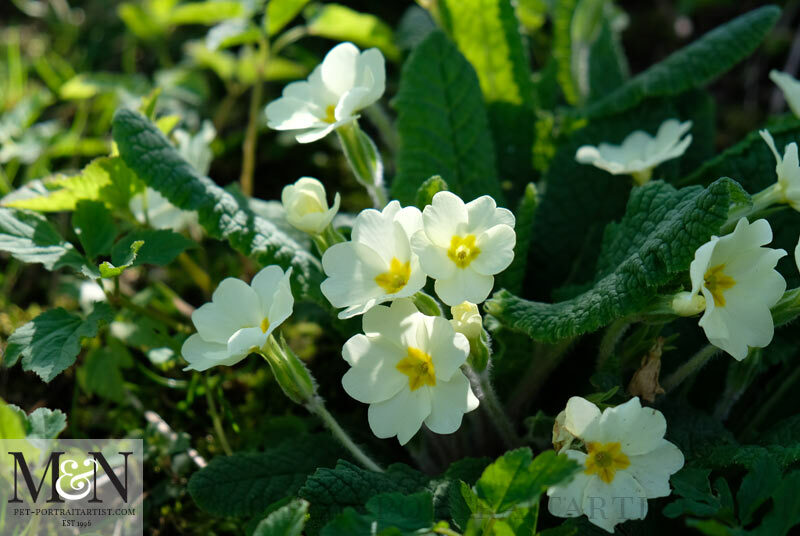 Of course this time of year is perfect for the Primroses and the woodland is ablaze with clumps. 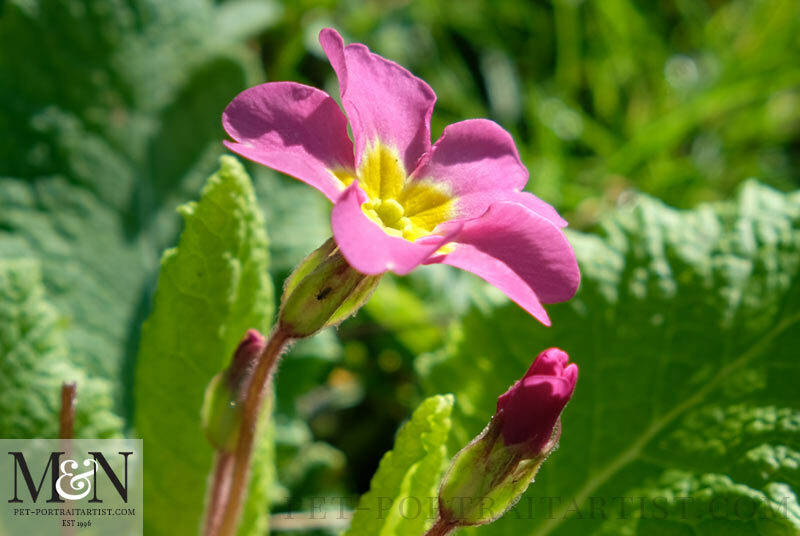 The Polyanthus dotted around break up the yellow Primroses and I have taken a couple of photos of them below basking in the dapped sunshine in the woodland. One of my all time favourite flowers are hellebores and we have a few different colours and varieties. I am always open to planting more though! My favourite is a white and green variety that is a very early flower starting in February. 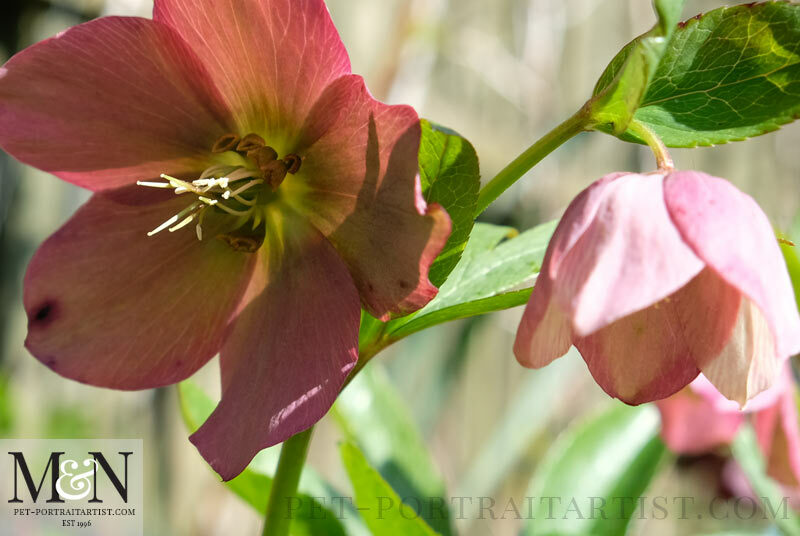 Similarly the light pink Hellebore below is another firm favourite. They are quite difficult to photograph though! 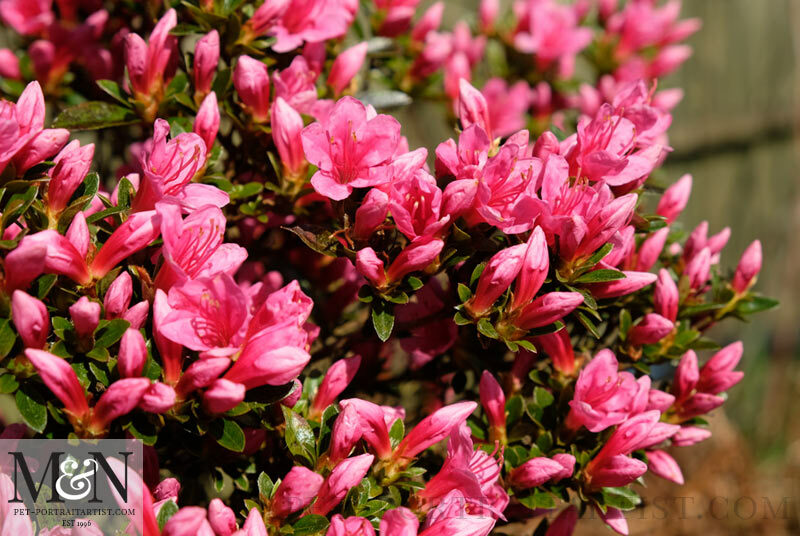 The Azalea is out, although not doing quite as well as last year, it’s vibrant pink draws the eye beautifully. 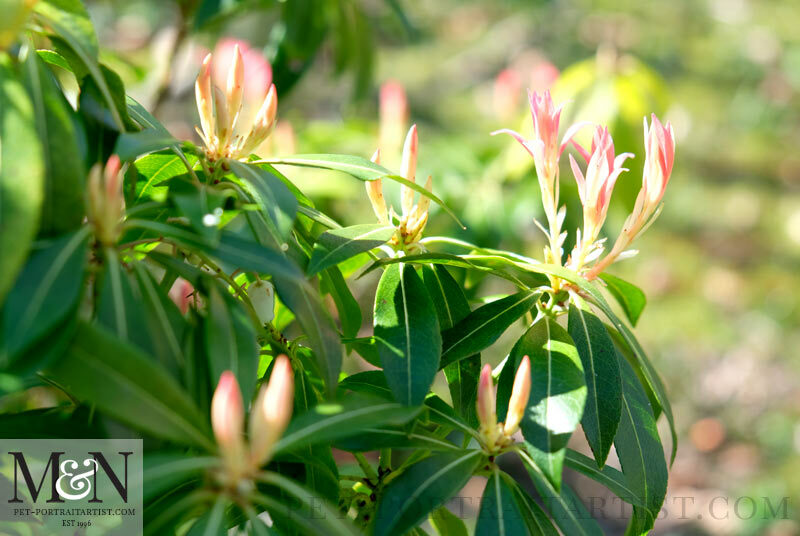 Finally one of my all time favourite shrubs is the Pieris and it is just starting to redden up in the sunshine. The flowers on it though are in full bloom, although I omitted to take a photo and I should have! I hope that our readers gardens, tubs, window boxes, or whatever you may tend are doing well. Here’s to another month of a lovely growing season for us all!